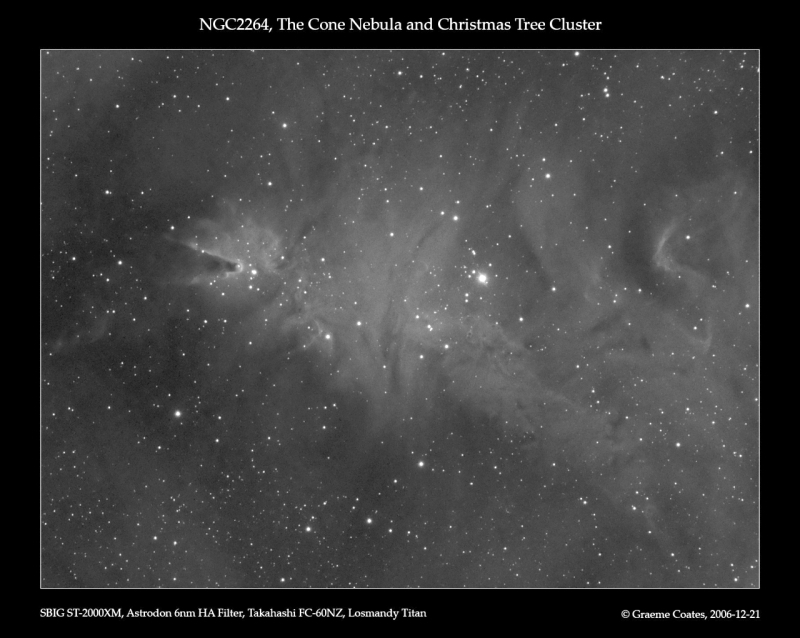 The Cone Nebula and Christmas Tree Cluster are part of a larger star forming complex within the constellation of Monoceros. 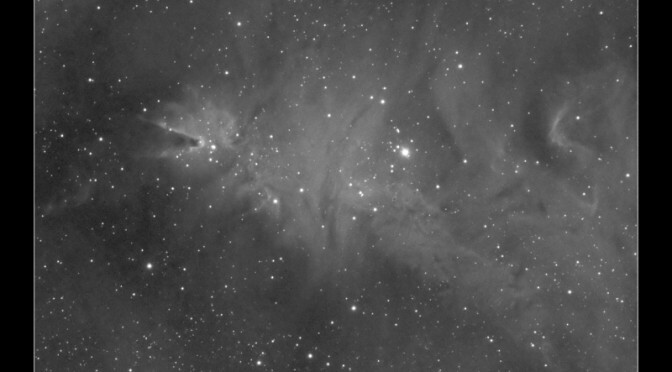 A 2.5 hour exposure in H-Alpha light taken 22nd December 2006 using an Astrodon filter shows only glowing hydrogen gas and stars – the blue reflection nebula near to the “Fox Fur” nebula (below the bright variable star S Monocerotis) often seen in photos of this region is largely invisible as most light is of the wrong wavelength and is rejected by the filter. There is a very clear face of a person above and to the left of what looks like a coyote howling at the moon in the cone nebula. Has anyone else seen this? Make the connection between Eros the GOD of love & Monoc eros, the cone nebula -is refered to the “Christ nebula” If GOD is love- are you reading into this what others have? LOOK at other images of the cone, above & left of what looks like a canine howling, you can see a clear picture of a face. Do you think canis major has more to it than most people know? HELLO! Try looking at an image from the Anglo-Australian Observitory, it’s a little blurry yet I hope you will be able to see the face from the nose up that I am refering to. Oops i’m not to up on greek mythology-was’nt Eros the child of Venus & Mercury? What would Monoc eros have to do with that?